There was family (and eating). 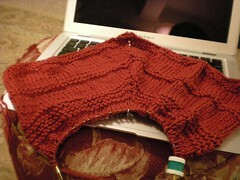 and began a matching Mitered Hanging Towel. Both are from Mason-Dixon Knitting Outside the Lines and use Hobby Lobby's I Love This Cotton yarn. It's softer than Peaches'n Cream or Sugar'n Cream -- nice for baby clothes, I think, but possibly too soft for the towel. 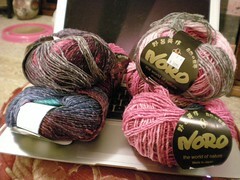 Noro Silk Garden Lite in 2014 (left) and 2032 (right). 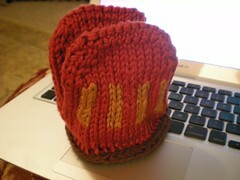 Purchased at KnitWit in Springfield, IL. I think I might want to make one of those two-row scarves. Ooo...I wish we had a HL nearby--I'd love to fondle that cotton! Most of our snow is gone, fortunately. I hate missing Thanksgiving. 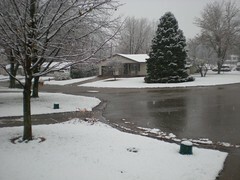 :( But I'll be home for a hopefully not-white Christmas.